Almo Professional A/V is the nation’s largest professional audio visual distributor with forward-thinking product integration, training, managed services, and technical support providing customers the full distribution experience on a local and a personal level. LG TECH TOUR - YOU DON'T WANT TO MISS THIS. 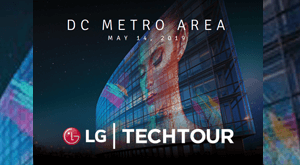 Experience up-close and hands-on the latest innovations in LG commercial display, mobile and solar technology at the Hyatt Regency Crystal City in the D.C. Metro area on May 14, 2019.